Diamond Mine Slot - ▶️ Spin for up to 2500 Coins! Although mining may not be the most obvious theme when you think about an online slot game, it actually offers a lot of room for creativity and unique gameplay ideas. The Diamond Mine slot from Big Time Gaming and licensed to Blueprint Gaming is a good example. It not only has some clever features, it also features an unusual extra row of symbols. The game has six cascading reels and is powered by the MegaWays game engine that gives you a different way to win with every spin. Let’s dig a little deeper into the features of Diamond Mine to find out why so many people play and enjoy it. The Diamond Mine slot is a 6-reel, 7-row video slot that is designed in a cartoon style and offers you a feel of America’s old wild west. As you would expect from the wild west, there is western background music to really set the mood. The game is the result of collaboration between Blueprint Gaming and Big Time Gaming. The interface has been designed to be simple, making it one of the easiest slots to get to terms with. 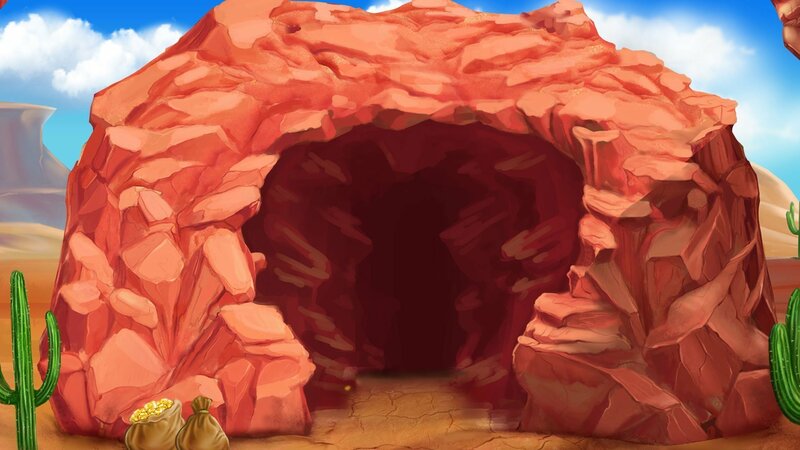 The game’s stone-backed reels are set on a mineshaft backdrop in the middle of the desert and are flanked by cactuses. On these reels, you will find A to 9 card values as well as mining tools and equipment as well as a smiling, bearded miner with a diamond in his hand. Controlling the game is easy. All you have to do is to use the scroll, which you will find on the right-hand side of the screen, to set the size of your stake. A control panel is located at the bottom of your screen, which will allow you to not only change the gameplay options, but will also show you your current bet, previous wins and bankroll balance at a glance. The game does not feature traditional spinning reels, but instead has employed a cascading reels engine. Following each successful spin, the winning symbols are eliminated and new ones cascade onto the reels to take their place. As long as there is a win, the cascade engine will keep on dropping symbols. You also need to pay special attention to the TNT barrels which randomly appear on the reels and transform into the same symbol. There are four high-value symbols that pay the highest and which you should be gunning for, namely: a bag of gold, crossed pickaxe and shovel, a lamp, a bearded miner and a large diamond. Of these, the diamond is the most valuable. If you get 2, 3, 4, 5 or 6 diamond symbols on adjacent reels, then you get 2, 5, 10, 25 or 50 times the amount you bet. There are also some lower valued card symbols – 9, 10, J, Q, K and A – which still give you the chance to gain some decent wins. In Diamond Mine, the sticks of dynamite represent the wild symbol which can substitute for all other symbols (except the bag of gold, which is the scatter) to give you winning combinations. No matter the reel size, a symbol that you will want to keep an eye out for is the barrel of TNT. When this symbol appears and explodes, it transforms into any other symbol, except for the free spin, bag of gold scatter. If you get a group of matching symbols, you might trigger an unexpected bonus combination win. The key feature that is sure to keep you coming back to dig for treasure with the Diamond Mine slot has got to be its Free Spins. This feature is activated any time you land four or more sack of gold scatter symbols within the same spin. You receive 12 free spins when this happens, and a further 5 free spins for every extra scatter which you hit. Any time you land a cascade win when playing the free spins, you increase the win multiplier by 1. The multiplier is limitless so, if you hit a cascading run of successful combinations, it is possible to earn some huge wins when playing Diamond Mine. Plus, to keep the free spins going, there is a special free spins scatter, being the sack of gold. Getting 3 sacks, awards an extra 5 free spins and 4 scatters an extra 10 free spins. The game is not linked to any fixed or progressive jackpot, but the bonuses and generous free spins should be more than enough to make up for this minor shortcoming. Diamond Mine does not have paylines in the traditional sense, but instead offers 117,649 different winning combinations with its MegaWays engine. Diamond Mine slot has a theoretical Return to Player of 96.43%. This medium volatility game offers the perfect balance between offering occasional large wins and the frequency with which smaller wins occur. Diamond Mine may be rather simplistic in terms of slot design, but it still remains highly enjoyable. Not only is it fun and vibrant, but the game’s excellent bonus features, increasing multipliers, cascading wins and free spins also make it a great place to win some excellent rewards.